As the Wall Street Journal reports this week that two of the serially charged Wall Street banks, Citigroup and JPMorgan, along with two foreign banks, Barclays and RBS, are expected to plead guilty as early as next week to criminal charges of massive fraud in the foreign exchange markets, some of the most powerful women in the field of finance and economics were speaking at a conference in Washington D.C. and taking on the system that allows this corruption to continue unchecked – six years after it collapsed the U.S. economy and blew up Wall Street. The conference was titled “Finance & Society” and featured luminaries like Fed Chair Janet Yellen, Senator Elizabeth Warren, Christine Lagarde, Managing Director of the International Monetary Fund (IMF), and Esther George, President of the Federal Reserve Bank of Kansas City, along with other important voices. 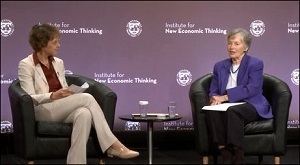 But the segment of the conference that has galvanized Wall Street reformers were the speeches by Brooksley Born, the former Chair of the Commodity Futures Trading Commission, and Anat Admati, a professor of finance and economics at Stanford University, a chief architect of the conference. Brooksley Born is best known as the sole regulator in the Clinton administration who attempted to regulate derivatives and became the target of bullying by then Treasury Secretary Robert Rubin, his enforcer, Larry Summers, and Fed Chair Alan Greenspan. Frontline aired an expose on the guts Born summoned to stand up to the Wall Street enablers’ cartel. In the end, of course, Wall Street had its way and derivatives remained unregulated. Born resigned her post. According to Born, too many exemptions have been carved out in the derivatives arena under Dodd-Frank, including derivatives used for hedging and foreign exchange swaps.